Hydroseeding is a great way to get a beautiful lawn fast! Norris Landscaping offers hydroseeding services to homeowners and would be pleased to provide a turn-key solution for your lawn, including soil preparation, grading, or simply applying the appropriate blend onto your prepared site. Our goal is to deliver the highest quality product and results to bring you complete satisfaction. Equally important is that you partner with a professional with the proper knowledge, equipment, and utilizes best industry techniques to ensure you get a premium turfgrass. Call today for a Free Consultation and written Estimate. 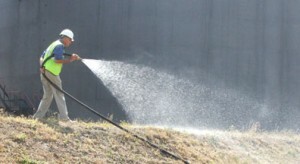 So, what exactly is hydroseeding? It is the process of combining seed, mulch, fertilizer, and healthy soil amendments with water, to mix in a HydroSeeder tank to form thick slurry. The slurry is then applied with pressure from a hose or tower, to the surface for seed germination and turf development. Hydroseeding is the fastest, most cost effective and highest quality method of seeding lawn, landscape and erosion control practices.